WEEE-HEE it's Friday!!!! Instant happy-maker! The weather here in Chicago is downright GLORIOUS!!!! 75+ WHAT?! I know, I'm soaking it all in! Cuz you never know where we will be next week! I hope to get lots of relaxing in (With the doors and windows wide open!! ), maybe a bike ride or two, and hopefully the inspiration I've been feeling stays strong. I'd love to use the inspiration (shown below) to have some fun this weekend! 1 - Inspiration for a Shoe DIY?! 3 - Inspiration for DIY Denim shirt! What are your plans?? Esp my Chicago/NorthEast ladies what are you doing outdoors - it is supposed to be beautiful!!!? *All image sources linked above, you can find them all on my Pinterest boards as well! Oooh, that gnocchi looks fab. Wow, the ombre chambre business is fantastic! Yes to the ombre denim! 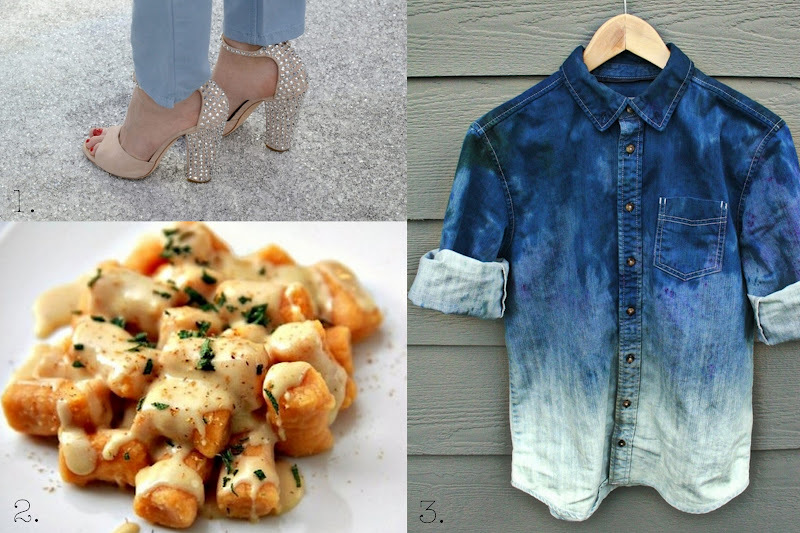 That denim shirt is fabulous and those gnocchi look so yummy! Have a fabulous warm weekend! Ohhh that denim DIY looks fab!! I might have to try that myself. Ahh that's so exciting!! I just got the email from shopbop, this is the best news I've gotten all week! I was in Chicago this weekend for St. Patrick's Day! The weather was beyond amazing--could not have been better! We were outside pretty much the entire time and I loved every minute. those shoes are to die for. gorgeous!